Rajasthan is one of the most beautiful states in India and popular for its vibrant culture, royal forts and palaces and panoramic sand dunes. Tourists often like to visit the state due to its rich and colorful cultural heritage. But the one big event that attracts many visitors every year is the famous Pushkar Cattle Fair that’s held between October-November at the time of Kartik Purnima (i.e. full moon). This year Pushkar cattle fair is celebrating from 18 to 25 November 2015. Pushkar fair takes place on the banks of Holy Pushkar Lake, which is known sacred according to several Indian mythological texts. The lake is surrounded by 52 bathing wharfs, where people come to cleanse their sins and cure diseases, whilst taking few dips in water. Well, what do you expect in the world’s largest livestock fair? Popularly known as the ‘camel fair.’ Here, around 50,000 camels are brought by their owners for sale. The more beautiful the camel looks, the higher is its selling price. Apart from camels, people also come here to trade other animals like horses, sheeps, goats and cows. 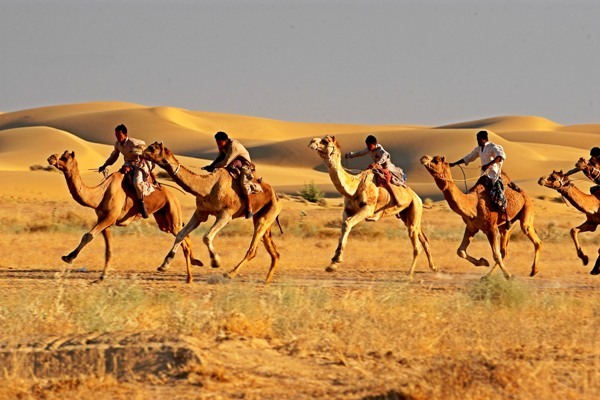 If you visit Pushkar cattle fair, then you must also try the camel safari to visit various small towns, While moving around these towns, you’ll notice difference in culture and can see closer lifestyle of the people living here. As you walk by the dessert terrain, you’ll find camels everywhere and their owners. This means you’ll be able to get closer glimpse of a cameler’s life and how they breed, raise and trade these beautiful animals. Very few people know the fact that Israelis have set up a Jewish Community Center known as ‘Chabad,’ here and locals can also speak Hebrew. Moreover, traditional Jewish recipes like jachnoon, cinnamon cake, etc. are served in few restaurants, Hence, Pushkar is aptly called the Israel of India, reflecting hint of Jewish culture too. While talking about Rajasthan, how can we forget about traditional string puppet shows known as ‘kathputli’ (kath=wood, putli=doll). These puppet shows are full of vibrant colors and tourists find them very interesting. In the fair, you’ll find several small stalls selling decorative items, bamboo sticks and camel-themed paintings. Apart from that, many seller also offer handmade Rajasthani shoes made from camel-leather. These attractive items will certainly create a burning hole in your pocket. It is considered as the holy land of Gods, and has one of the very few existing Brahma (Hindu creator) temple. Exterior of the temple is adorned in beautiful colors, and has few traditional idols or Gods and several other symbols. Being considered as a sacred Hindu land, non-vegetarian food and alcohol are hard to find here. But mouth-watering vegetarian dishes like poha and falafal are served here. You’ll surely like delicious delicacies of Pushkar. Many colorful hot air balloons can be seen here floating above the fair ground during Pushkar fair. If you like the view of these colorful balloons in mid-air, you can also take these to blow up into the air. Just imagine how much fun you’re going to have in this colorful land and in this Rajasthan tour. You’ll surely go back with load of fun-filled memories. Posted in Festival and tagged Brahma Temple in Pushkar, Pushkar, Pushkar Cattle fair, Pushkar fair, Rajasthan Tour on August 29, 2015 by Zaki.